There is skepticism and resistance to innovations associated with agro-biotechnology projects in the developing world, leading to the possibility of failure. The source of the skepticism is complex, but partly traceable to how local communities view genetically engineered crops, public perception on the technology's implications, and views on the role of the private sector in public health and agriculture, especially in the developing world. We posit that a governance and management model in which ethical, social, cultural, and commercialization issues are accounted for and addressed is important in mitigating the risk of project failure and improving the appropriate adoption of agro-biotechnology in sub-Saharan Africa. 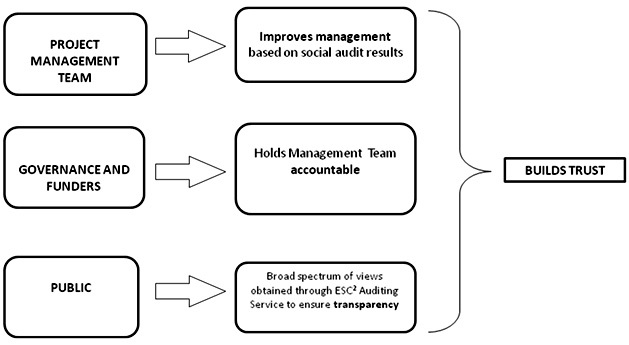 We introduce a social audit model, which we term Ethical, Social, Cultural and Commercialization (ESC2 ) auditing, and that we developed based on feedback from a number of stakeholders. We lay the foundation for its importance in agro-biotechnology development projects and show how the model can be applied to projects run by Public Private Partnerships. We argue that the implementation of the audit model can help build public trust through facilitating project accountability and transparency. 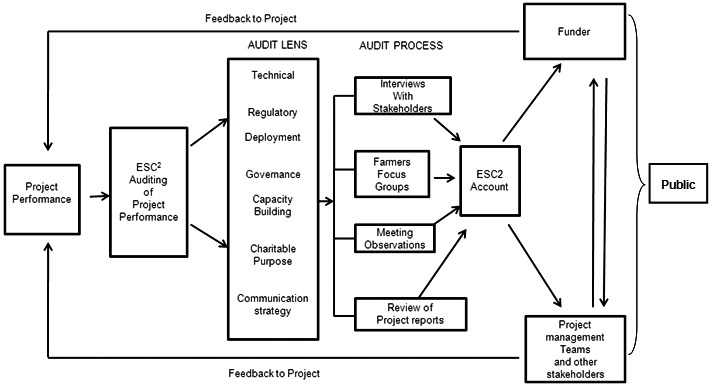 The model also provides evidence on how ESC2 issues are perceived by various stakeholders, which enables project managers to effectively monitor and improve project performance. Although this model was specifically designed for agro-biotechnology initiatives, we show how it can also be applied to other development projects. Key words: Social auditing; public-private partnerships; agro-biotechnology; environmental accounting. Agro-biotechnology public private partnerships (PPPs) are viewed as important means of making the benefits of agro-biotechnology available in the developing world (World Development Report 2008). On the private sector side, life science firms provide genes and biotechnology research capacity, which complement the assets of the public partners such as national and international agricultural research institutes (for example, Consultative Group on International Agricultural Research, CGIAR). These assets include local or national knowledge germplasm collections, conventional breeding programs, seed distribution, and marketing research material. There has been a particular increase in agro-biotechnology PPPs focused on genetically modified (GM) crops in developing countries over the last decade (World Development Report 2008). In 2008, the Water Efficient Maize for Africa (WEMA) project, funded by the Bill & Melinda Gates Foundation (BMGF) and the Howard Buffet Foundation (HBF), was created to provide royalty-free maize to small-scale African farmers by 2018 or earlier. The goal of the project is to increase productivity for poor farmers in sub-Saharan Africa and give them access to crops that can protect them from frequent drought. The project is led by the African Agricultural Technology Foundation (AATF), partnering with Monsanto, a private United States (US)-based seed company, and the International Maize and Wheat Improvement Center (CIMMYT), a research center of the CGIAR. The model was developed and designed for the social auditing of the WEMA project. Social audits can be defined as an independent means of identifying, measuring, and reporting the ethical, social and environmental impact that a project has (Johnson 2001). Stakeholder trust is crucial for companies and influences consumer spending, corporate reputation, and the ability of companies to navigate the regulatory environment (Edelman 2009). Lack of mutual trust and clashes of private and public cultures were identified as primary stumbling blocks to the promise of agro-biotechnology PPPs in the developing world (World Development Report 2008). For the purpose of this paper, we use a multidisciplinary definition of trust developed by Rousseau et al (1998) where trust is defined as "a psychological state comprising the intention to accept vulnerability based upon positive expectations of the intentions or behaviours of another'' (Rousseau et. al. 1998, p. 395). The issue of trust is also important to PPPs working on agro-biotechnology because GM crops in agriculture are controversial and considered risky in some communities. In traditional agricultural regions, especially in Africa, indigenous food crops have deep cultural and religious significance. As a result, innovations affecting crops are perceived with distrust, which can increase the risk of failure of agro-biotechnology initiatives. Examples of failed agro-biotechnology initiatives due to mistrust are prevalent worldwide. For example, civil society organizations led the uprooting of all GM maize planted in Malawi in 2003 due to public health concerns (Bokor, 2004). A year earlier, the Zambian government rejected GM food aid offered by the US due to concerns by the government and about the health and environmental implications of the grains (Maharaj 2002; Manda 2003). In Kenya, there was poor adoption of drought tolerant sorghum, which commentators have attributed to poor consultation with farmers, plant breeders, extension agents and social scientists that resulted in public distrust and skepticism among community members; hence the project's failure (Oduol 1995). Public mistrust in agro-biotechnology projects run by PPPs can also arise from public fear of corporate control of agriculture and its benefits. This is not unfounded as the global seed trade is currently dominated by a handful of giant corporations (Jordan 2002). Dominance of the global seed market by private companies is perceived to retract control that farmers have over traditional farming practices of seed recycling, subsequently leading to their reliance on private companies for seeds. National governments also fear relinquishing their food security sovereignty to the private sector due to their emerging dominance of the global seed market (ETC Group 2008). According to Action Group on Erosion, Technology and Concentration (2008), almost 70% of the global proprietary seed market is controlled by the top 10 seed companies. In addition, the top 3 companies (Monsanto, DuPont, Syngenta) together account for about half of the worldwide proprietary seed market (ETC Group 2008). In recent years, a number of large-scale science initiatives such as the Human Genome project set aside part of its funding to address ethical, legal and social issues associated with the project (Dove 1998; Meslin, Thomson, & Boyer, 1997) with the intention of building trust. In addition, pharmaceutical and biotechnology companies have incorporated internal ethics offices or ethics consultants, or implemented sustainability reporting with the hope of building trust with customers and stakeholders (Finegold et al 2005). Other mechanisms developed to build trust and accountability have included disclosure statements and reports, performance assessment and evaluation, participation, and self-regulation (Ebrahim 2003). These methods reflect either upward accountability (such as performance assessments) or downward accountability (such as participation and community engagement), where upward accountability is responsibility mainly towards donors and funders and downward accountability is directed towards stakeholders (Ebrahim 2003). However, social audit is more inclusive because it places accountability internally (among the partners) and externally to donors and stakeholders. Social auditing is regarded as an important tool in building trust (Gao & Zhang 2006), and improving accountability and transparency (Zadek & Raynard, 1995; Ebrahim 2003; O'Dwyer, 2005). We define it as a process whereby an audit team collects, analyses, and interprets descriptive, quantitative and qualitative information from stakeholders to produce an account of a project's ethical, social, cultural and commercialization performance and impact. 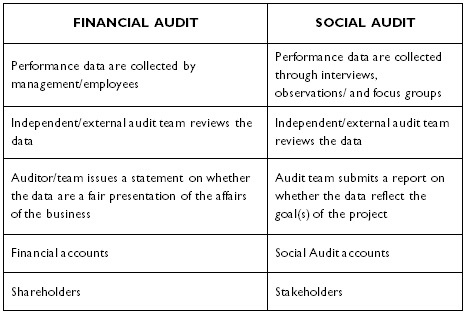 Social auditing can be likened to financial auditing (Table 1): Performance data are collected, and the data are reviewed by an independent and external expert (auditor) who verifies that the information is accurate. The auditor issues a statement confirming the accurate representation of the business or project. The difference between these processes is that financial auditing deals with financial accounts while social auditing is focused on social accounts. There is also a difference in development: financial auditing has been around for several hundred years and has generally accepted principles and standards while social auditing is in its early stages of development. Social auditing has been practiced since the 1970s and some of the earliest known examples were conducted by Abt Associates, a US consultancy firm that incorporated social audit accounts into its own annual report (Abt Associates, 1976). However, it was not until the 1990s that the practice took a more systematic approach (Henriques 2000). A group of companies and organizations, including the National Economics Foundation (a UK think-tank) and Traidecraft, a trading and charity company, came together to form the Institute of Social and Ethical Accountability. Through the Institute and other ventures, a number social audit models were developed (Dey 2007; Raynard 1998). The goals of these models were to make an organization more transparent and accountable and to re-orient the activities of organizations towards the interests of its stakeholders (Zadek & Raynard 1995). Although not widespread, non-profit organizations and social enterprises have also practiced social auditing (Ebrahim 2003). For example, CIET in Pakistan, an academic NGO, has conducted a community-based social audit in two districts in Afghanistan to document community experiences and views of health service performance with the purpose of raising the quality of health services and minimizing inefficiencies (IDRC 2008). Private companies and businesses have also been interested in the application of social auditing for the purpose of moving their companies towards environmental sustainability and long-term profitability through the development of sustainability reports. Sustainability reporting is a form of social auditing that is tailored for businesses and incorporates the principle of sustainable development. There has been an increase in sustainability reporting by companies over the last decade. According to CorporateRegister.com, a directory of Corporate Social Responsibility (CSR) resources, the number of sustainability reports increased from 462 in 1998 to almost 3,000 in 2008. Companies seem to be realizing that sustainability reporting is essential in improving trust with customers and stakeholders. Nike, for example, through its sustainability reporting initiative has been said to have steadily transformed its relationship with customers and stakeholders, and improved work practices (Zadek 2004). The social audit model introduced here differs from other popular social audit models in two major ways: first, our model is tailored to projects run by PPPs. For example, the New Economics Foundation (NEF) model has been applied to a number of organizations including some public and others private (Zhang et al 2003), but not to PPPs or projects run by PPPs. Secondly our model deals with improving internal management and strengthening public accountability, not one or the other exclusively. For example, the Traidcraft and Body Shop models are primarily a means of strengthening public accountability while the Beechwood model was designed primarily as an internal management system thus obviating the need to disclose the results publically (Zhang et al, 2003). The Beechwood model, along with other common social audits, was designed to be used by an organization to assist in planning, managing and measuring social accounts in response to the challenges from social and environmental concerns (Zhang et al, 2003). Our model is designed to advise management so that they may improve their practices and to strengthen public accountability and transparency with stakeholders. 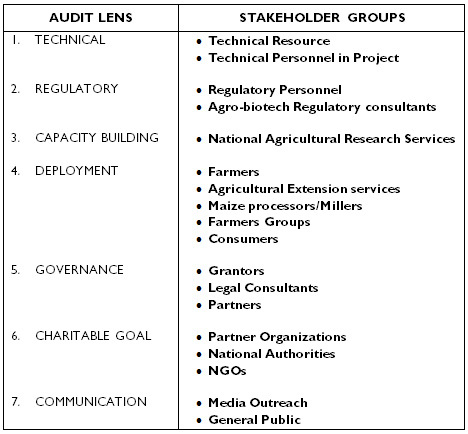 Learning from these previous models and taking into account the intended goals of the WEMA project, we developed a social audit model tailored to agro-biotechnology PPPs and stakeholder engagement, which we applied to the WEMA project in 2008. In the following section, we describe how this model was developed, how it can be applied to agro-biotechnology projects, and its potential to be franchised to other development projects. To develop a social audit model for agro-biotechnology projects, we created a framework that took into account the goals of the WEMA project, which generally covers all aspects of a typical agro-biotechnology initiative managed by a public private partnership. The goals of the WEMA project are divided into seven major components and include: technical, regulatory, deployment, capacity building, charitable purpose, project management and governance, and communication. We refer to these seven components as audit lenses, and they are shown in Figure 2. In the model, these lenses shape the four processes through which ESC2 issues are made explicit. These processes include: 1) Interview with stakeholders; 2) Focus Groups with farmers; 3) Review of project reports and; 4) Meeting Observations (Figure 2). For the stakeholder interviews and focus groups, we developed 2 questionnaires, one with closed-ended questions and the other with open-ended questions, which reflected the seven audit lenses. The closed-ended questions, which were administered first in the interviews, were analyzed numerically while the open-ended questions were part of an interview guide. Samples of the questions are shown in Table 3. These questions were stakeholder-specific. The questionnaires were carefully designed to uncover ESC² issues in the project. 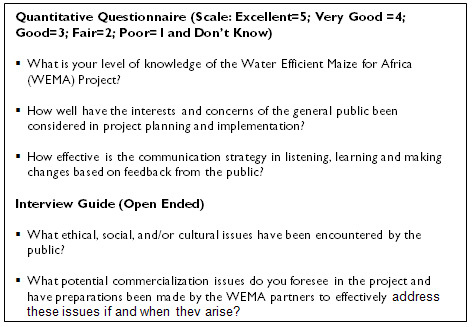 These questionnaires were first piloted with 17 internal interviewees within the WEMA teams. Based on the feedback we received from the interviews with internal stakeholders, we revised the audit tools, and then piloted the revised tools through face-to-face interviews with 26 external stakeholders to the WEMA project. The main feedback from internal stakeholders was to improve the clarity of some of the questions in the closed-ended questionnaire and to simplify and standardize the open-ended questionnaire. The main recommendation from external interviewees was to expand the stakeholder groups. The open and closed-ended questionnaires were finalized following the pilot interviews with internal and external stakeholders. Thereafter, we conducted 50 face-to-face interviews and administered the finalized questionnaires. In total, 101 interviews were conducted. Although ESC² issues identified by key stakeholders became primarily clear through stakeholder views and focus groups, meeting observations and project reports were also important in the process. The final phase in our model (Figure 2) was the communication of the social audit results to funders, partners and the stakeholders through a report, which included details of how the social audit was conducted; key findings from the interviews; ESC2 issues that arose from our review of project reports and observation at meetings and recommendations to the grantors (BMGF and HBF) and project managers of WEMA on how the ESC2 issues raised by stakeholders can be addressed in the following year of the project. There were important lessons from our audit, which could be applicable to other social audit programs. We found that it was important to develop the stakeholder list in conjunction with the project being audited. For example, the target audiences for the WEMA audit mirrored the ones identified in WEMA's own communication strategy. As these broaden through the life of the WEMA project, the audiences for the social audit will broaden simultaneously. We adopted this approach in order to obviate any damaging effects to the WEMA Project that could occur by raising broad public awareness about the audit before WEMA has had an opportunity to raise awareness about the goals of their project. T hrough our meetings with various stakeholders, it was obvious that some issues varied by region and each country had its own unique obstacles including different perceptions on GM crops and regulatory challenges. In addition, some interviewees were not fully familiar with the WEMA project when we conducted the social audit; this showed us the importance of project knowledge. We found that opinion was dependent on knowledge of the Project. Generally, if an interviewee lacked knowledge of the Project, their opinion of the Project was low and when they had a better knowledge of the project, they had a more favorable opinion. A number of interviewees attributed their poor knowledge of the project to the early nature of the project. However, we found it was important to conduct an audit early in the project in order to establish a baseline for ESC2 issues and project evaluation and track them over the life of the project. Finally, we observed that interviewees were very happy to be consulted in the audit process and realized the importance of providing a fair and diverse representation of all stakeholders to satisfy the principle of inclusivity. Although the model presented here was specifically tailored to agro-biotechnology initiatives, it can be applicable to other life science and health development projects by taking into account the following five principles. These principles were important in performing the social audit of the WEMA project.  Creation of a framework based on the intended goals of the project and the stakeholders involved.  Identification of stakeholder groups and the application of the principles of inclusivity and materiality in stakeholder involvement.  Engagement of stakeholders in designing the questionnaires and pilot testing of tools that will be used in the social audit.  Development of a system to communicate the results to partners, funders and the public in order to ensure transparency.  Use of an accountability system in which management can be held accountable by the funders and governance in addressing the findings of the audit. These principles reflect the importance of stakeholder engagement, transparency and accountability, which are important in fostering trust among partners and between partners and stakeholders. The model is simple, straightforward, and easy to implement. It can be tailored to other projects managed by public private partnerships in the health and life science sectors, by creating a framework based on the intended goals of the project to be audited and following the principles outlined above. Although there are inevitable disadvantages associated with social audit such as cost and time commitment (Dawson, 1998), social audits can be feasible when an organization does what is "possible, realistic and manageable" (Social Audit Network, 2005). It is best to start small and scale-up as necessary. According to SAN (2005) and through our experience, costs significantly reduce in the second and subsequent years once systems are set up and processes are refined. With busy schedules, lengthy agendas and limited time, organizations generally view social audits as superfluous and prefer not to invest extensive time in it. However, our experience has shown that the time required in preparing for and conducting a Social Audit decreases in subsequent years and the benefits that could accrue in terms of accountability, transparency and building trust with stakeholders can be crucial to project success and stakeholder confidence. Although the WEMA project and social audit processes are still in their early stages, we will continue to evaluate the impact of the audit on project transparency, accountability and its direct impact on fostering trust with the community and among the partners. The social audit will help foster improved management practices, accountability and transparency, which in turn will help to build trust both among the partners in a project, and between the project and the public. The model is premised on a one year project cycle in which an ESC2 account is produced. The results and recommendations of the ESC2 account produced through the audit process are fed back into the next cycle through the Grantors and the PIs of the project. The critical component of the audit process is the engagement of stakeholders and focus groups with farmers. The observation of meetings and project reports is crucial; it is mainly from these engagements that views and issues of key stakeholders become palpable. All four audit processes are performed through a lens network, which have been designed to account for all aspects and phases of the project. After the first cycle, depending on the ESC2 issues that were raised, a series of indicators are developed to track the incorporation of these changes in subsequent years. We are grateful to Jocalyn Clark for her comments on earlier drafts of the manuscripts. This publication was funded by the Bill & Melinda Gates Foundation. The findings and conclusions contained within are those of the author and do not necessarily reflect official positions or policies of the Bill & Melinda Gates Foundation. The co-operative Sustainability Report: Altogether Different and Making a Difference. BOKOR, R.K. (2004). Resistance to Genetic Engineering in Africa, Synthesis/Regeneration: A Magazine of Green Social Thought. EDELMAN (2009). Edelman Trust Barometer: The Tenth Global Opinion Leaders Study. ETC Group (2008). Who Owns Nature? Corporate Power and the Final Frontier in the Commodification of Life. FTSE 2008, FTSE4Good Index Series. http://www.ftse.com/ Indices/FTSE4Good_Index_Series/index.jsp (2009, July/20).